As much as this is my review of Thomas Arcaro’s Aid Worker Voices: Survey Results and Commentary, it is also a snapshot of my ongoing discussion I have had with the author prior to reading his book and discussing the current state and future potential behind the project. Based on a census-style 60 question survey that just over 1000 aid workers completed between January 2014 and March 2015 and that is documented on the companion website, the project gathered an incredible range of responses on the state of play of aid work and the aid workers inside the industry. From the very beginning we were sober about the fact that our respondents were self-selected and, in the end, the survey was only conducted in English, narrowing that self-selection (p.5). But all qualitative, often ethnographic, engagements with aid workers suffer from various biases and generalizability was never the aim of the project. I agree with Tom that ‘focusing of this need to vent, share, support and laugh together’ (p.8) is an important aspect of any reflective writing and engagement process. Another core premise of the project and book is Tom takes a positive, humane encouraging approach toward the subject matter of understanding the aid industry through quantitative survey data and many, often very long and thoughtfully articulated, personal reflections that really highlight the ‘voice’ aspect. 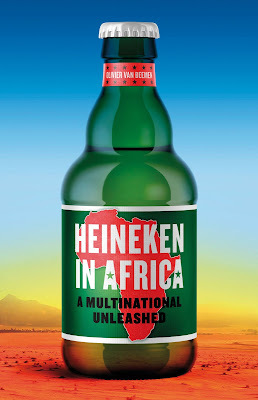 Here, ‘global citizens’ come together in a ‘humanitarian aid system (that) is far more inclusive than even the complicated ALNAP model infers’ (p.19) is a key premise the project relies on-even if there are many complexities and imperfections within the industry. Whether the questions relate to faith and religion, gender or family, the insights from the survey offer an interesting mix between not-so-surprising insights (organizational contexts are often paternalistic and many aspects of the industry are not child-friendly) and a confirmation of how aware about various inequalities and problems many respondents are. So for many colleagues and academia or regular readers of the blog notions of complexity and many different shades of grey will sound familiar. But the thing about aid work that they don’t tell you…you can’t un-see what you’ve seen, good or bad. I can’t un-see or un-experience the amazing days I spent at the beach on the South China Sea in Vietnam any more than I can un-see or un-experience working in an HIV orphanage in Uganda (Becca, 36 years old, female, unmarried) (p.79). I agree with Tom that ‘being human means to constantly battling contradictions and dealing with multiple options’ (p.83) - a fundamental fact we often tend to forget in our desire to ‘professionalize’ aid work and workers. As much of a work-in-progress as this book may seem, it is important to stress that Tom has spent not only time to read through all the responses, but that he put some thought into the quotes, the voices, that are (re)presented throughout his book. I think that this illustrates the purpose of the project really well: To provide a space for articulating our humanity in a context of sometimes dehumanizing circumstances-both from within the sector, but also from powerful actors outside the industry who create humanitarian ‘theaters’ in the first place and then complain about the failings of those who step in to help. But survey project and book are still grounded in the daily experiences and routines of ‘doing aid work’. Comments about ‘Human resources is one of the weakest departments in aid organizations’ (p.144) and strong criticism of MONGOs that Tom summarizes as endeavors often made up by ‘those with big ideas and skinny jeans coming from the global north’ (p.177) are hardly surprising and are a strong reminder that simply brushing off ‘the system is broken’ critique is also not an option to current and future challenges. Having talked to Tom in two long Skype calls recently I know that he is aware of some of the shortcoming of the current book and welcome critique openly. Because of the nature of the Aid Worker Voices project the book is missing ‘punch lines’; from a research perspective such ‘confirmatory research’ is important and relevant, but it is also not easy to ‘sell’ to journalists, bust aid workers and ‘civilians’ pressured for time: Tom is working on a series of blog post and other multi-media projects and it will be interesting to see what emerges from the ‘big data’ of survey result. The book is still a very important contribution to ongoing efforts of ‘representing’ aid work and aid workers in new and different ways, using different tools and writing formats. In that sense Aid Worker Voices is also an experimental contribution, with some of the chapters a bit too long while others, especially towards the end of the book, seem a bit short and lacking more context. Some of the graphics are also a bit difficult to read which turned my focus almost immediately to the longer reflections rather than the aggregated overviews. I know that Tom was eager to ‘get the book out’ and I look forward to discussing the results further and see how this project evolves-it seems to be the proverbial first step which sets an important journey into motion! Let’s end on an aid worker voice that captures the spirit of communicating differently with each other that underlines much of the project. 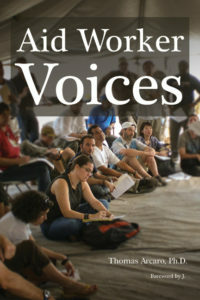 Arcaro, Thomas: Aid Worker Voices. ISBN 978-1530476121, 242pp, USD17.00, CreateSpace Independent Publishing Platform, 2016.